Technology advancement is a day to day thing new features and design keep popping out for our smartphone. 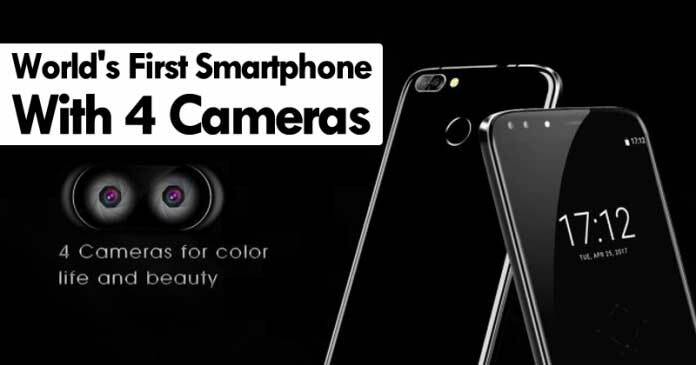 The new development in Town is the Four Camera featured on a new smartphone to be launched by a Chinese Phone brand. Oukitel is the first phone brand to surprise us all by launching a new smartphone U22, with the dual lens, at front and back. Oukitel is a brand that many people don’t know of yet. Oukitel is known for making different smartphones that are very resistant with low price Oukitel has already launched the Oukitel U20 with double posterior lens last year ending and now has wanted to go a step further. The Chinese phone brand presents its new model the Oukitel U22. As we may have it is the first smartphone to feature four cameras. The U22 has two rear cameras and two front cameras. Also, they will be equipped with LED flashes. Surely a future bet on the part of the company. The slogan that was chosen by Oukitel for the U22 is “The world is beautiful. Why not take a photo?” The device will be available to book in mid-May, though its official launch date is still unknown. The Oukitel U22 will be available in three colors: white, black and gold. Undoubtedly, with the Oukitel U22, Oukitel has taken a major advantage in the smartphone market, and there is a lot of curiosity about the phone. So, What do you think of this new smartphone? Simply share your views and thoughts in the comment section below.